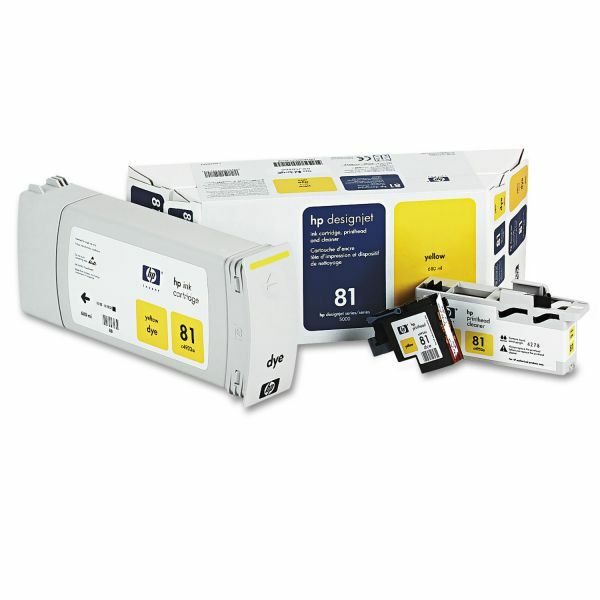 Includes ink cartridge, printhead, and printhead cleaner. Built-in smart chips monitor printhead operation and send alerts. 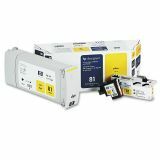 HP 81, (C4993A) Ink Cartridge/Printhead/Printhead Cleaner, 680 mL, Yellow - The 81 Dye Value Packs include ink cartridge, printhead, and printhead cleaner in one box, to provide production printing customers with added cost savings and convenience. HP 81 dye-based inks are newly formulated to deliver the most brilliant, photo-realistic images, and vivid, full-color graphics in Designjet 5000, 5500, 5500PS, 5500UV and 5500P UV. HP Jetexpress technology results in fast, unattended printing without compromising image quality. The 1" wide printheads with 512 nozzles per printhead lay down a wider ink swath compared with 240 nozzles in the HP Designjet CP series ink systems. Built-in smart chips monitor printhead operation and alert you when it is time to replace the cartridge.